Colour us surprised, as rumours of a stock Android version of the Galaxy S4 to be made available were swirling, we weren't at all convinced, especially given that Google has given out a skinned device like the HTC EVO 4G in the past (with Sense UI and all). 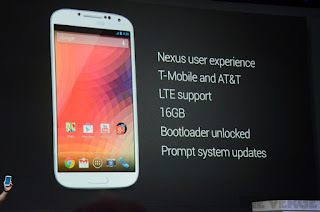 Hugo Barra mentioned that the Stock Galaxy S4 would come with an unlocked bootloader, LTE support for T-Mobile and AT&T and a Nexus experience at the tough to stomach cost of $649 (probably $659 for Canadians) which is a far cry from the more affordable and arguably better value in the Nexus 4. According to MobileSyrup, the Stock Android equipped Galaxy S4 will only be made available to US customers. We hope this somehow changes in the future.